While my blog posts have tapered off a bit in the last few weeks, my furniture activity certainly has not. I’ve been a bit swamped between commissioned pieces, getting my booth at Morgantown Market ready for Christmas, and shuffling our apartment around to make room for pieces waiting in the wings. I’m pretty much churning out furniture one right after another. Today and tomorrow will be filled with deliveries and pick ups. 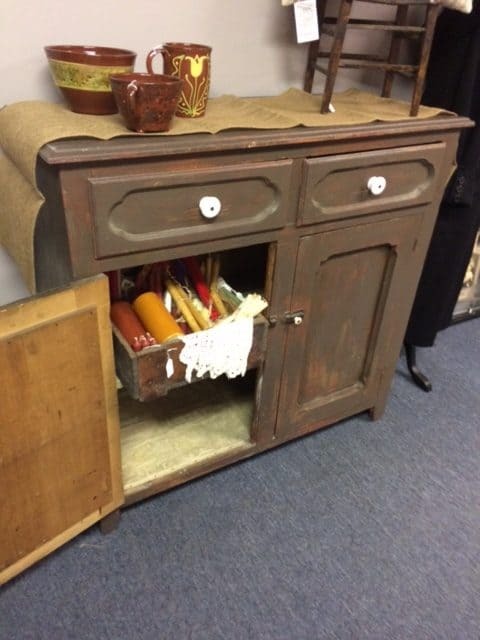 A white dresser with matching nightstand will be going back home to their owner just down the road, and I’ll pick up a small dining room sideboard to refinish. I don’t have any photos of these, but they turned out beautifully! I also finished another white piece for a dear friend of mine from church. For a little bit there, I felt like all I was doing was painting white! I feel like it’s harder to paint a piece white than any other color because white takes quite a few coats to get full coverage. Primer definitely helps to prevent bleed through and reduce the number of coats that are needed, but painting white is not my favorite thing to do. Pep talks and reminders of how beautiful the piece will be when I’m finished are what keep me going. 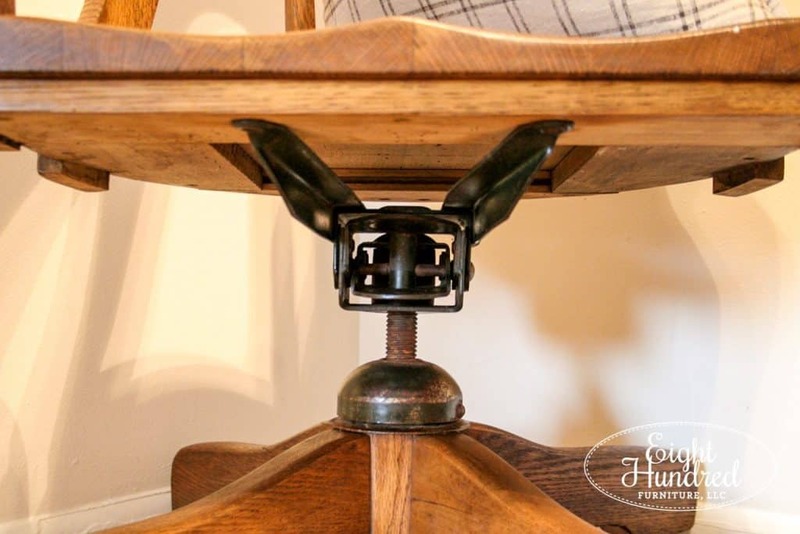 The banker’s chair will be delivered on Friday to Rooted and didn’t need much sprucing up other than a good wipe down with Miss Mustard Seed’s Hemp Oil. The metal mechanism underneath has a new luster now and the dust is all gone. The wood on this chair is gorgeous. 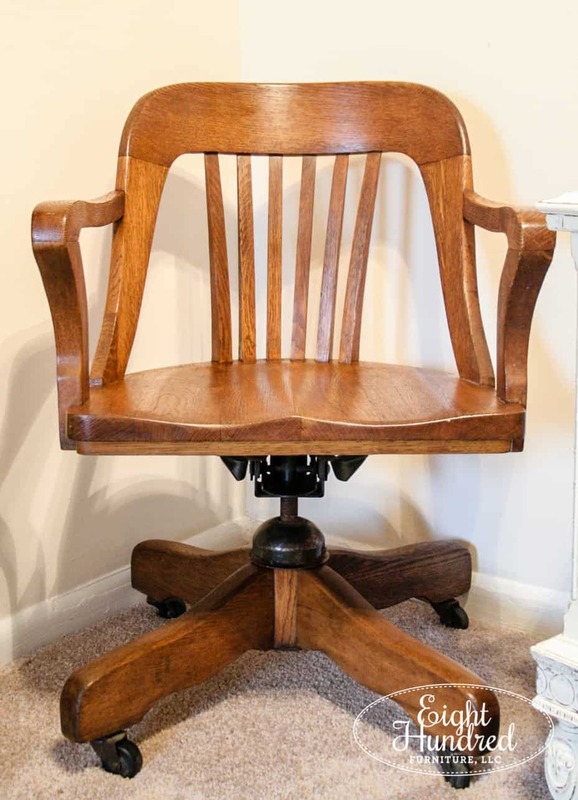 I’ve always wanted a chair like this for my office, but it doesn’t fit underneath of our desk, so I decided to sell it. My friend’s little white nightstand turned out amazing! 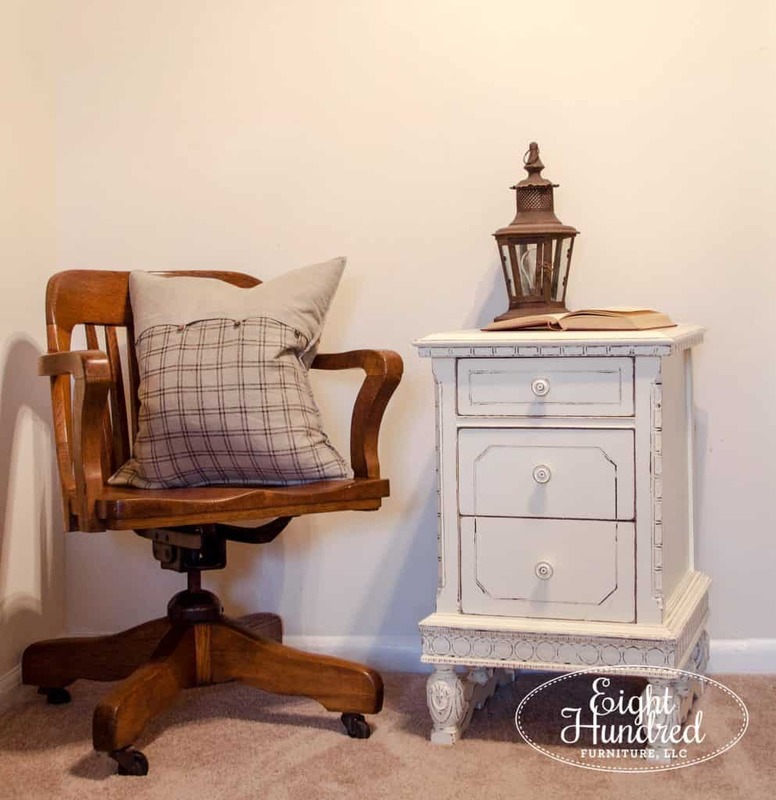 It was painted with Annie Sloan’s Chalk Paint® in Old White and sealed with General Finishes High Performance Topcoat in Semi Gloss. 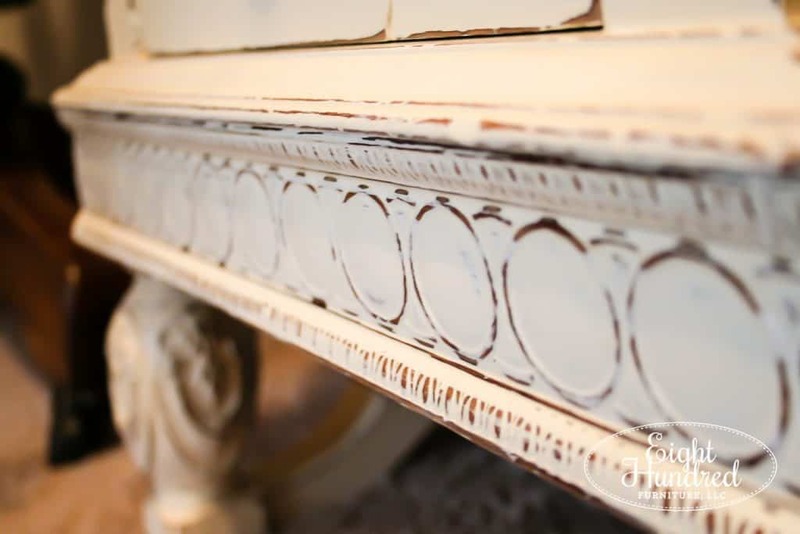 It has the most beautiful carvings and detail work over every surface. I had a blast revealing it with a bit of sandpaper. Instead of using Clear Soft Wax, I used a water-based topcoat. 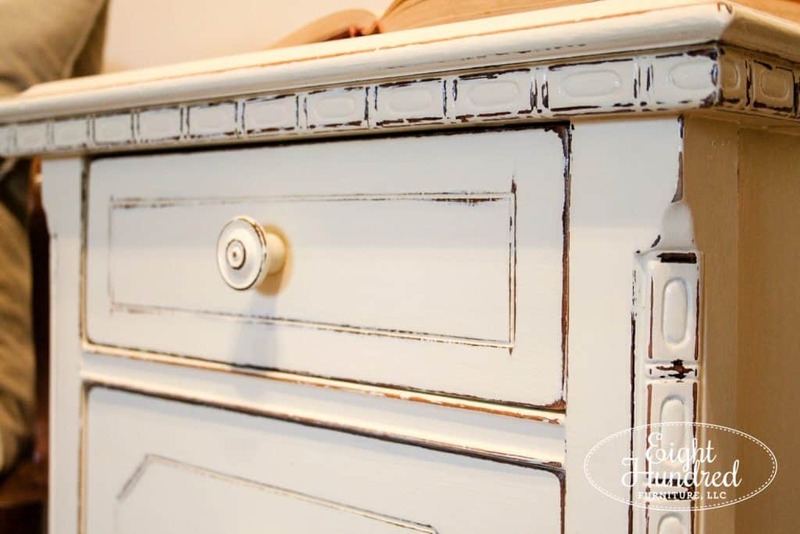 At first, I was a bit apprehensive about covering Chalk Paint® with a water-based topcoat but it worked just fine. My friend wanted a shiny finish, which you can’t get with wax. The topcoat didn’t drag and General Finishes High Performance Topcoat doesn’t yellow over time, so it was a total win. After the nightstand was finished, I set a record for my fastest furniture makeover to date with this jelly cabinet. 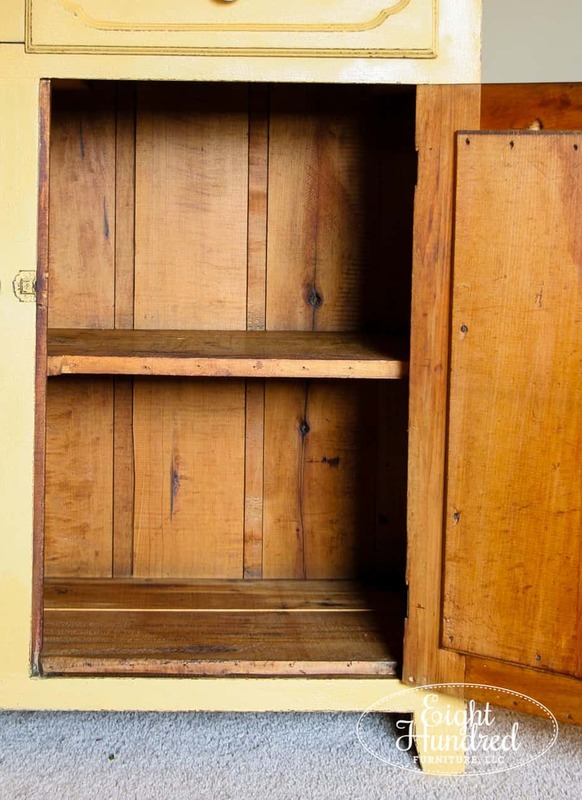 I have a client that had been looking for a piece with a shape like this but jelly cupboards are usually out of my budget. I tried bidding on some at the auction on Friday but the price quickly soared out of my range. On Wednesday, I took some wreaths over to Morgantown Market and went shopping to see if any of the dealers had a piece that would work. Tucked away in the back was this perfect piece! It was old, lovely, and I scooped it up. Stacey, the owner of the market, helped me load it into my truck and once it got home, Marc and I hauled it up the stairs and the makeover began. Before I did anything to the piece, I gave it a thorough cleaning. Not only did it have a lot of dirt and dust all over it, but there were several nests of some type of insect in just about every corner. They were made out of dirt so I’m not sure what kind of bug does that, but needless to say, I spent about an hour just vacuuming and wiping everything down. That’s just part of working on old pieces. It probably sat in a barn or some sort of storage location for a good while, but not anymore! 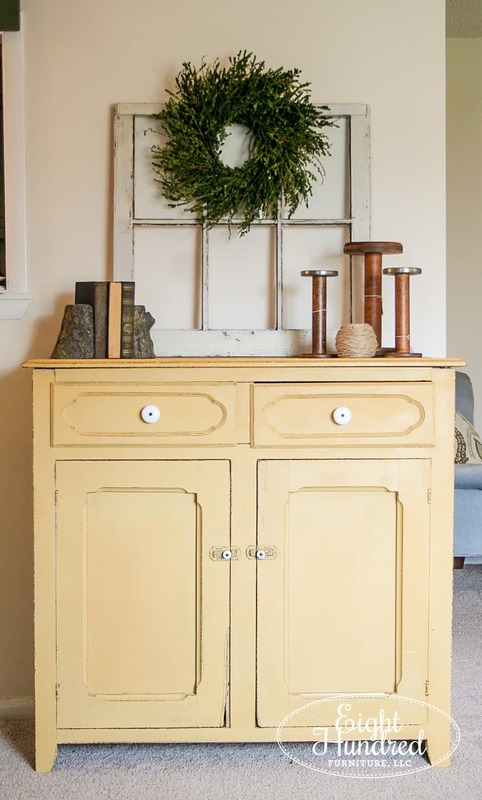 My contact and I went back and forth on which paint color would suit this piece the best, and we decided on one of the Miss Mustard Seed colors of the month, Mustard Seed Yellow. 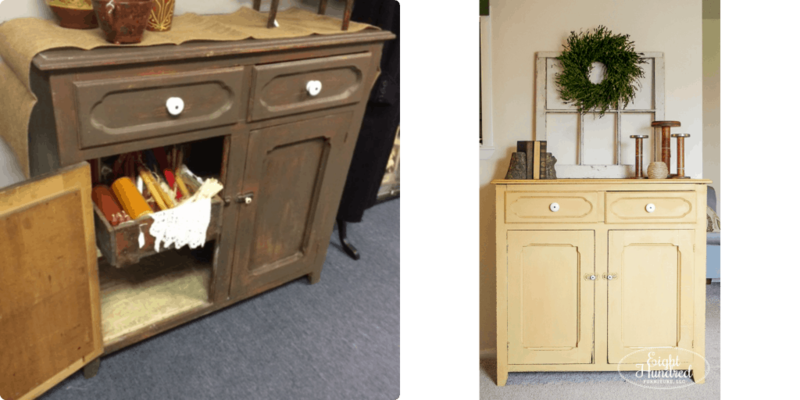 It took 3 coats to get full coverage and after some distressing and Hemp Oil, this jelly cupboard has experienced quite the transformation! 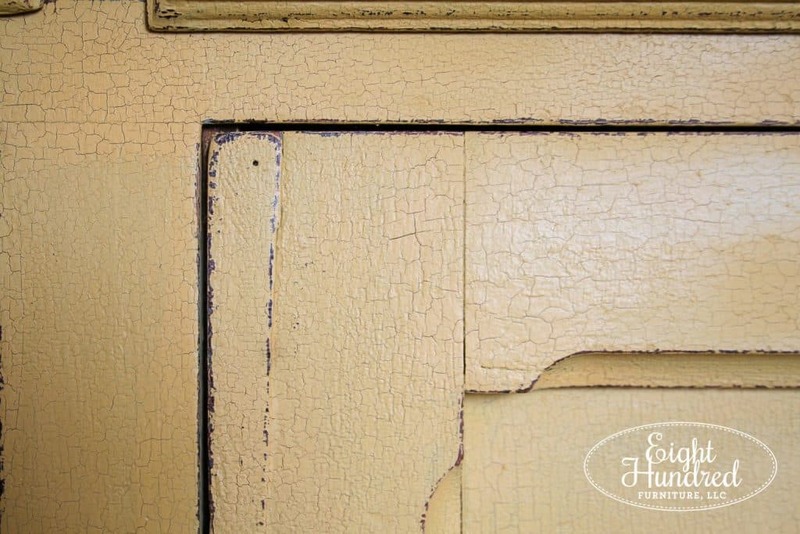 The original finish on the cupboard had “gatored” and crackled over time, which gave the milk paint a perfect canvas to shine. 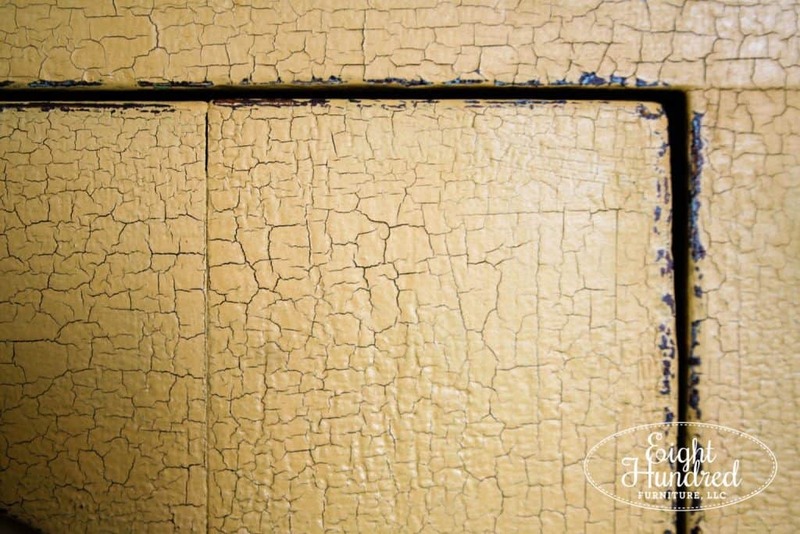 The milk paint naturally crackled all on its own. 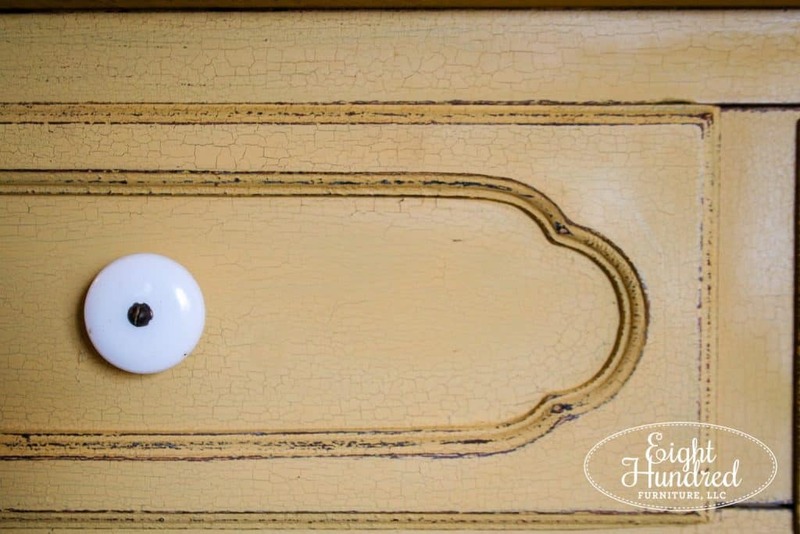 That’s one of the best aspects of using Miss Mustard Seed’s Milk Paint. It takes on a life of its own and gives you an authentically old finish. 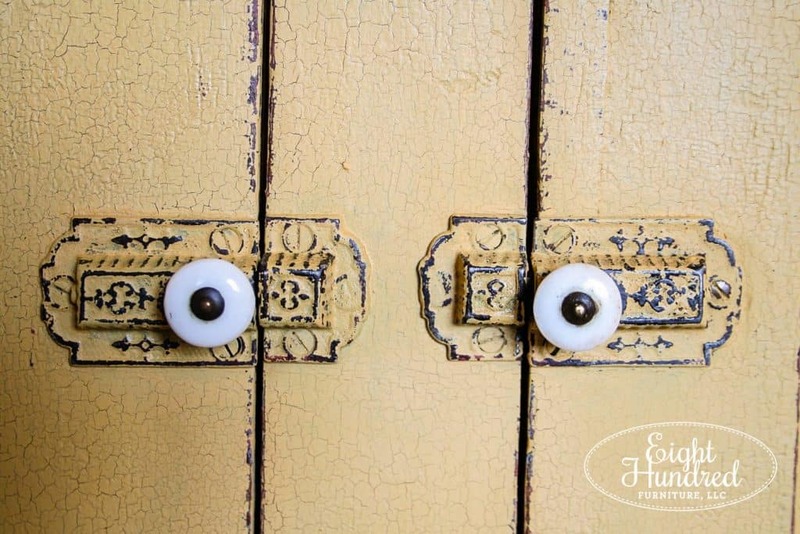 The little porcelain latches on the doors are so precious. 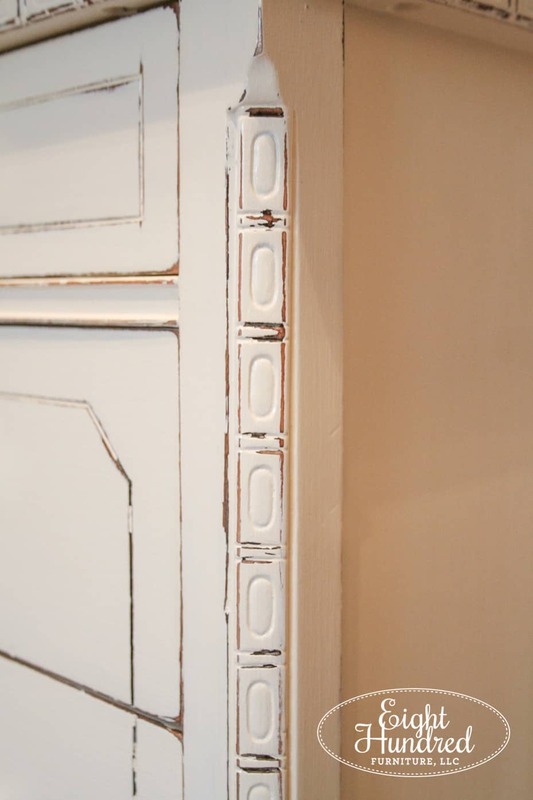 The drawers have beautiful carved details that came out of the woodwork (no pun intended) with a bit of distressing. I literally applied Hemp Oil over the entire surface of this piece. Inside, outside, drawers, shelves, walls, doors, top, sides, etc. The wood was soooooo thirsty and it has a new luster and depth of color now that it’s hydrated. Isn’t that wood just stunning? 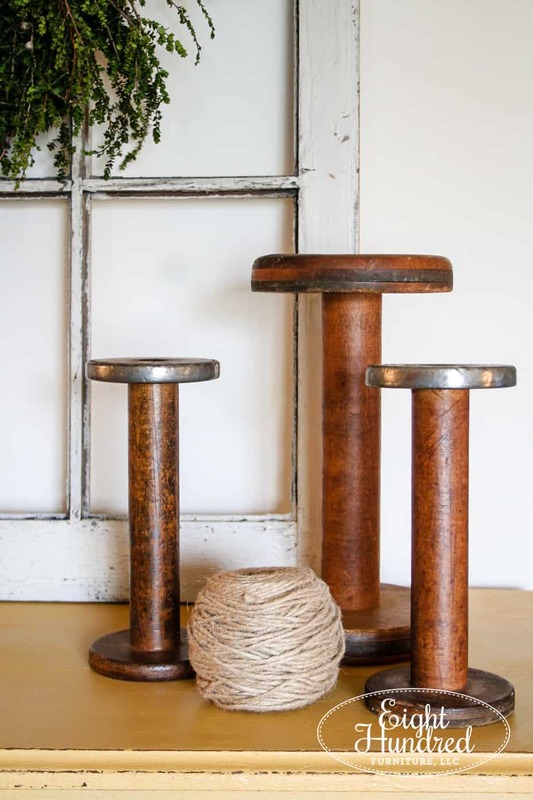 I ripped out the fabric liner that was on the shelves and patiently plucked out each of the rusty upholstery tacks that held it down. 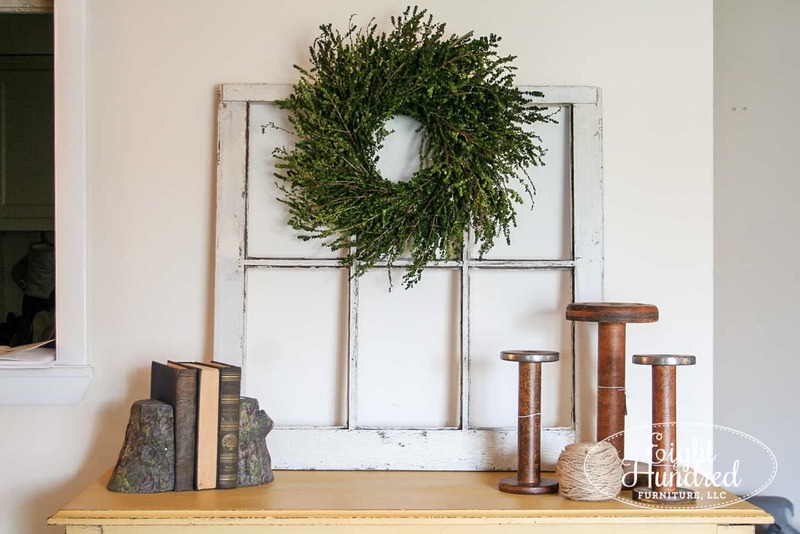 I staged the piece with an old window sash that I snagged from Creekside Antiques and one of my wreaths that arrived in my latest shipment. 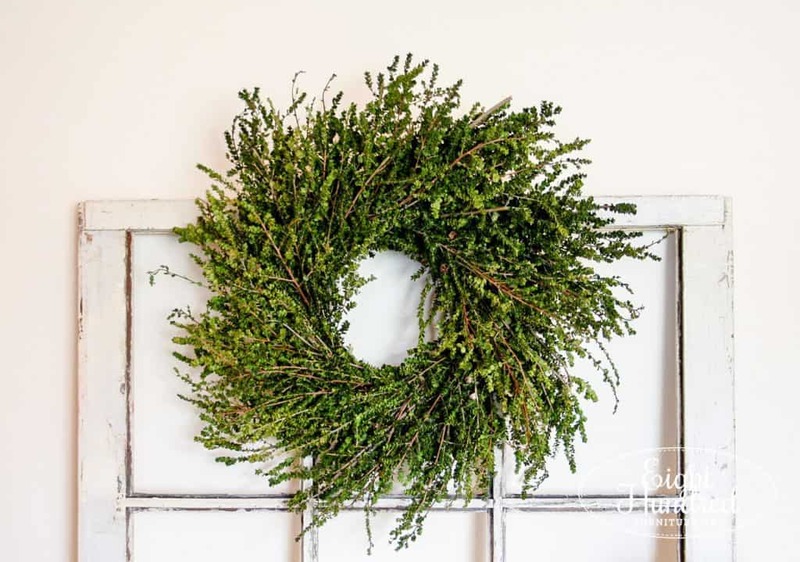 I’m always looking for alternative natural ways of decorating for the holidays. This Lepto wreath is bushy and beautiful and I’m a super huge fan. 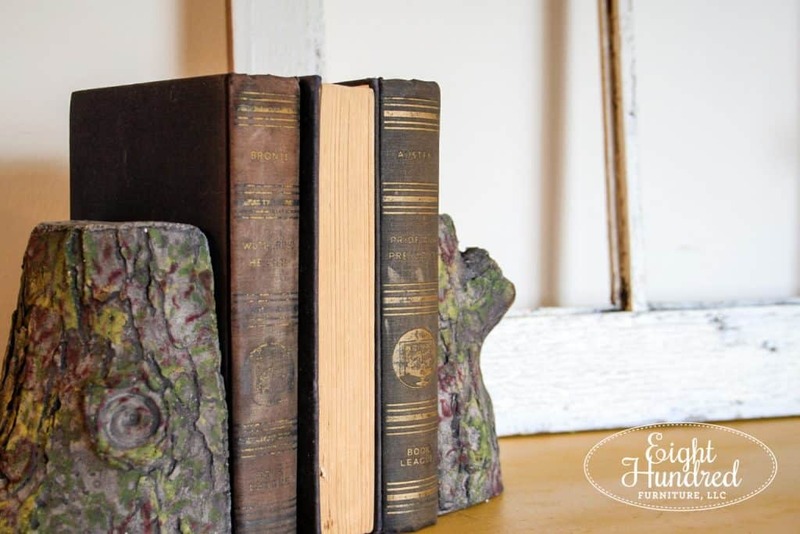 and flanked the other end of the window sash with my old copies of classics (Pride and Prejudice, Wuthering Heights, Sense and Sensibility) sandwiched in between Cyprus stump bookends. 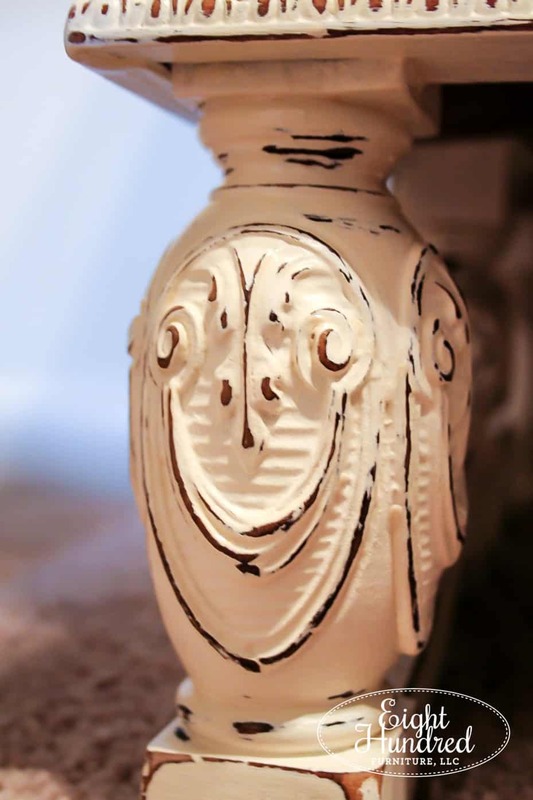 All of these pieces have undergone lovely transformations, but this piece is my favorite!